This very simple example demonstrates how undifferentiated QAI SPECTRE™ analog circuits self-design using QAI quantum wave diffusion. QAI quantum wave diffusion is patent pending self-organizing algorithm. Here it used with the circuit synthesis system to recognize a verbal audio command taken from the 1970 Colossus science fiction movie. The structure formed demonstrates Poincaré recurrence self-organization. The new synthesized circuits are exported to SPICE models for importation into current electronic design automation systems for circuit refinement, layout and fab. Any dynamical system defined by an ordinary differential equation determines a unique flow mapping phase space on itself. The system is said to be volume-preserving if the volume of a set in phase space is invariant under the flow. More specifically for instance, all Hamiltonian systems are volume-preserving because of Liouville's theorem. The theorem is then: If a flow preserves volume and has only bounded orbits, then for each open set there exist orbits that intersect the set infinitely often. 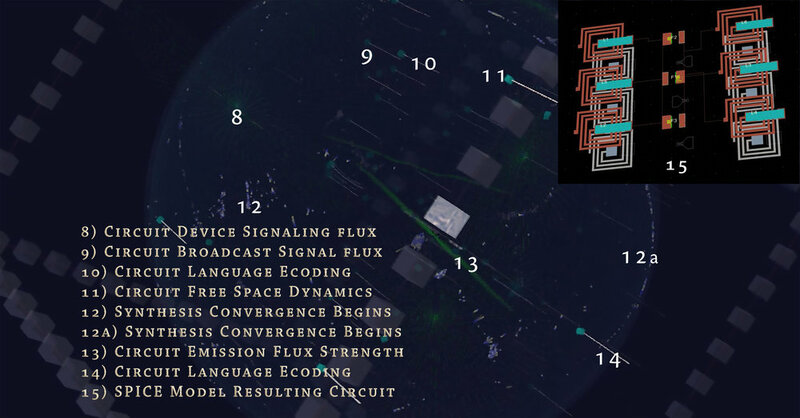 In the QAI SPECTRE™ automated analog circuit non deterministic super Turing machine synthesis system these orbits define behavioral analog semiconductor III-V EHF adaptive circuits. The resulting self-organized circuit multi-chip module solution is automatically synthesized to a SPICE model integrated circuit description. SPICE ("Simulation Program with Integrated Circuit Emphasis") is a general-purpose, open-source analog electronic circuit simulator and circuit specification language. It is a program used in both integrated circuit and board-level design to check the integrity of circuit designs and to predict circuit behavior. There are many free/commercial SPICE simulators available. The QAI SPECTRE™ SPICE model output is imported into current analog electronic design automation (EDA) systems for III-V circuit refinement, layout, simulation and fabrication. Compatible EDA systems include Keysight ADS, NI AWR MWO, Cadence Virtuoso and many other platforms. QAI SPECTRE™ SPICE models simulate using many SPICE systems. QAI SPECTRE™ Automated Design Process. This involves defining QAI SPECTRE™analog circuits using the QAI SPECTRE™ circuit language, which is automatically translated by the design, simulation and synthesis environment into active circuits. The I/O pads are then configured with either simulated or real data sources to stimulate the configured analog circuit descriptions. The circuits interact and self-program using a novel quantum signaling algorithm to create the optimal circuit solution. The circuits are next synthesized into SPICE models for importation into EDA tools.